The MIHR-Foundation, a good contact of Sergio & Anja Brina, organized a conference on the topic of: Family. This conference lasted altogether three days and we as UPF (Universal Peace Federation) have been invited as speakers on the second day. At our arrival, we received a wonderful welcome by the Muslim brothers and sisters of the MIHR-Foundation. After clearing technical things, Sergio Brina, the regional representative of UPF Düsseldorf, gave the first presentation to introduce UPF with the Five Principles of Peace. 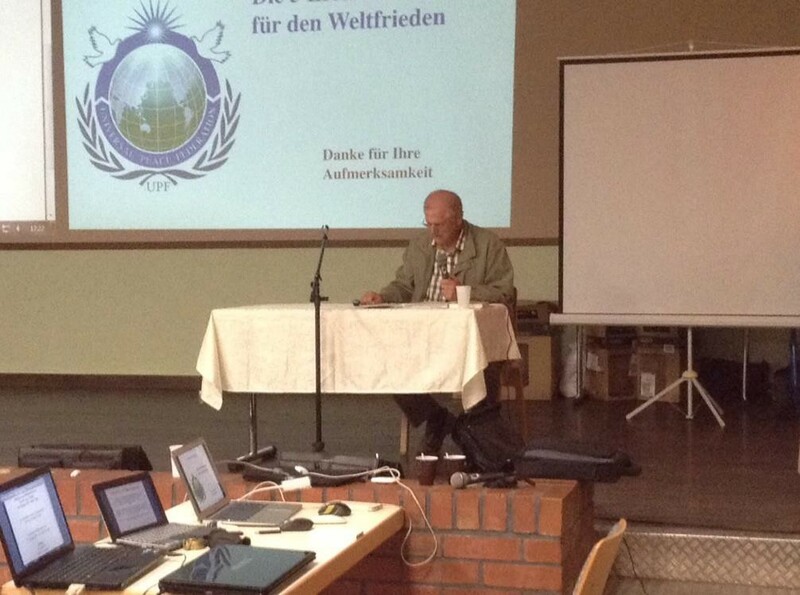 The atmosphere was set for Fritz Piepenburg, member of the national board of directors of UPF, who talked about general principles of the family from the interreligious viewpoint of UPF. First and foremost, Fritz declared, that he is talking about the traditional family: One father, one mother and children, because in our days there are so many new definitions of family around that people get easily confused, if they are not educated properly in their own family. Warmth and Security should be provided by parents to children in the family. Schools and universities provide education on an external scientific level, but the family educates members of the family to learn sympathy and how to treat other human beings. Every aspect of human relationships applied in human society can be learnt within the family. It helps, especially younger people to integrate into society. Furthermore, Fritz talked about the Three Blessings that God has given to the first human ancestors, Adam & Eve Gen 1 : 22. A session of questions and answers wrapped up this session. The MIHR-Foundation prepared a wonderful dinner, Turkish style, for all of us. It has been delicious. Then we saw two videos from the religious masters of the MIHR- Foundation with German under titles. All religions are actually only one religion. All human beings can be saved and brought back to Allah. Modern tools like radio, TV and internet are useful tools to send out the message of the Koran to the entire world. Exhortation to the Muslim leaders for witnessing in order to save all human beings, etc. During the next break we exchanged information brochures and books about our thoughts and founders, like the autobiography of Reverend Moon titled: My Life for World Peace. We realized that other religions also have their challenges to bring people to their conferences. We are sitting all in the same boat.